Have the holidays snuck up on you again this year? 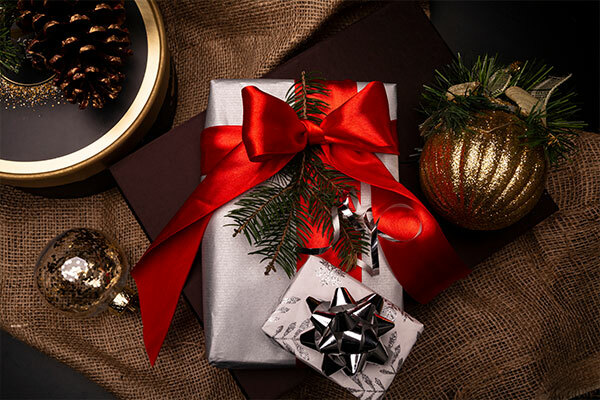 Don’t get overwhelmed with the search for the perfect present! We’ve compiled a guide of some of the best holiday gifts for fitness lovers, and it should serve as inspiration for sourcing presents for everyone on your list. There’s nothing worse than struggling with tangled headphones before a workout, which is why these wireless earbuds are the way to go for fitness enthusiasts. Each pair offers unprecedented sound quality and up to five hours of play time per charge. They are sweat and weather resistant, and simple to track down if you misplace them, thanks to the Bose Connect App’s “Find My Buds” feature. Help your favorite fitness junky work out those muscle kinks for good with the TriggerPoint foam roller. The patented design has a rigid, hollow core with multi-density foam on top. One session is all you’ll need to experience its advantage over lesser rollers, which is why the TriggerPoint is the roller of choice for coaches, massage therapists, and professional athletes. Give your friend’s feet the cushioning they deserve with a pair of Sanuk sling shoes. Each pair’s footbed is made from recycled yoga mats, and they’re designed to be comfy, stylish, and supportive for sore arches. Actually, they’re so cute you’ll probably order a pair for yourself as well. Your favorite home-based fitness enthusiast will appreciate the options this Roku stick offers for streaming thousands of workout videos from premiere fitness channels. Able to connect to almost any TV, the Roku stick is one of the most cost-effective ways to watch TV. For those who value tracking every health statistic throughout their day, no fitness watch compares to the Fitbit Versa. This touchscreen watch will track everything from your workout, heart rate, and sleep quality, and it’s also waterproof up to 50 meters per water. Best of all, it supports texts and calendar alerts, making it the ideal smartwatch for both fitness and daily use. If your struggle to peel your friend off her Peloton bike, it’s time to introduce her to the newest home-based boxing service: FightCamp. For a monthly subscription, you gain access to premiere boxing instructional videos and “punch trackers” that monitor each punch for real-time statistics. It’s the perfect way to bring your workout to the next level on days you don’t want to make it to the gym. As Ultimate Ear’s most powerful speaker to date, MEGABLAST offer rich sound at 360 degrees, and they are fully waterproof and weatherproof, ensuring they can join the friend that’s lucky enough to receive them on any adventure. Bring your friend’s yoga practice to the next level with a \fit mat, which pairs with Amazon Alexa to talk you through your yoga routine. As a bonus, this non-slip mat folds up automatically with one motion. We all know a fitness enthusiast who struggles to fit in each workout while traveling. You can give the gift of convenience with Kettle Gryp, a deceptively simple device that lets you create custom kettleballs at home by clamping it on to any standard hand weights. Lightweight and simple to pack, the Kettle Gryp expands your range of motion with free weights, ensuring you can slim down your necessary workout equipment. It seems too sci-fi to be real, but this jump rope really works. The embedded LEDs help you keep track of your jump stats by showing your completed number lit up in front of you. You can look at your results long after the routine as finished, as the rope syncs your jump stats, calories burned and workout time with your iPhone, Apple Watch and other apps. You can also use its recommended interval training sessions for a bigger challenge. Is your running partner forever struggling to keep her phone in hand while you work out? Consider gifting her an audio Spotify music player. You can sync your Spotify library straight to it and play the music even without service. This tiny gift gives over four hours of continuous playback per charge, making it perfect for long workouts in spotty service. It’s easier than you think to help your friend take his passion for fitness to the professional level. AFPA has provided certification for over 110,000 graduates, and this self-paced program offers the opportunity to earn professional certification in a matter of months. The entire course can be completed digitally, but traditional learners can also request print textbooks, ensuring that it sets you up for professional success. Keep things ultra-convenient for your yoga partner with this on-the-go carrier strap for yoga mats. It spares you the awkwardness of lugging a mat under your arm and transforms it into a convenient back sling instead. Try this ingenious ab workout enhancer for yourself, and you’ll soon be gifting it to everyone on your list. Simple to use (but far from painless) this wheel gets results fast. It’s a fantastic way to improve core strength, and the standard device can support up to 250 pounds. Best of all, it’s easy to toss in a suitcase for convenient traveling. Help your fitness friend stay cool during difficult workouts with this cooling towel that drops in temperature as soon as it makes contact with water. Designed to help you regulate your body temperature on swelteringly hot days, you can toss the towel in the washing machine afterward for convenient cleaning. Keep things both active and lighthearted on warm summer nights with this glow in the dark frisbee. Easy to spot in all light conditions, this frisbee relies on an ultra-bright LED light array to prevent the game from ending as the evening gets dark. For the friend who forever wants to be out on the water, you can’t do better than gifting him an inflatable paddleboard from Red Paddle Co. This ultra-durable board packs into a backpack, making it convenient for the most minimal among us. Keep it in your car for any moment the mood strikes to get in a water workout, and you’ll never go full sized again. Keep your favorite cyclist safe this winter season with an ultra-bright bicycle light that connects with your smartphone to provide crash and thief alerts for a smoother ride. The super bright LEDs improve visibility even in daylight, and their intelligent design lets them blink faster and brighter when most need the light. No one likes carting around a heavy water bottle during long runs, and this streamlined running belt offers a hands-off alternative. Made of lightweight neoprene, the belt is waterproof and tear-resistant, meaning it will withstand whatever your workout throws at it. For the cycling fanatic friend who’s forced indoors in wintry weather, the CycleOps smart trainer is a fantastic gift. This indoor trainer attaches to any bike, and it creates controlled resistance to personalize the workout difficulty. The integrated Bluetooth technology lets you sync your favorite virtual training software to customize the ride even further. Post workout smoothies are the pinnacle of a morning well spent, so give the gift of a ninja blender this holiday season. The Nutri Bowl duo works both as a smoothie blender and food processor, meaning this device can be used for making everything from hummus to cookie dough. Best of all, the innovative Auto IQ setting allows you to turn on the blender and walk away until it finishes. Give the gift of convenient toning with these quality resistance bands. You’ll receive two bands (light and heavy resistance) along with a convenient carrying tote. Add these bands to your workouts, and you’ll get a more significant benefit from every move. Few things are more off-putting than a stinky water bottle, but it’s difficult to remember to stuff it in the dishwasher regularly. You can avoid that problem altogether with the LARQ bottle, which creates pure water in under a minute by using UV-C light to neutralize up to 99.9999% of harmful bacteria within. The double insulation ensures your water stays chilled, meaning that you’ll never have to worry about cleanliness before packing it in your bag. It’s hard to argue with exercise advantages of a treadmill, but most designs are too bulky for small living spaces. Not so with the Treadly. This tiny treadmill folds up tightly enough to fit under your bed while still giving you a safe and satisfying workout. It’s revolutionary for apartment dwellers, and you can use it underneath a standing desk as well. Give your friend more bang for her workout buck with this pair of wrist or ankle weights. One size fits all, and their unobtrusive design is made to move so that you can add a comfortable level of resistance to every yoga, running, or aerobic workout. Did a fitness gift on your holiday wish list not make our ranking? Drop a comment about it below!